$2,549.00 This may be in stock for quick delivery; please call! The Vintage One 1FR flugelhorn was designed to be well balanced and compatible with the player's concept of sound. C.G. Conn brings back old-world craftsmanship in the Vintage One series. 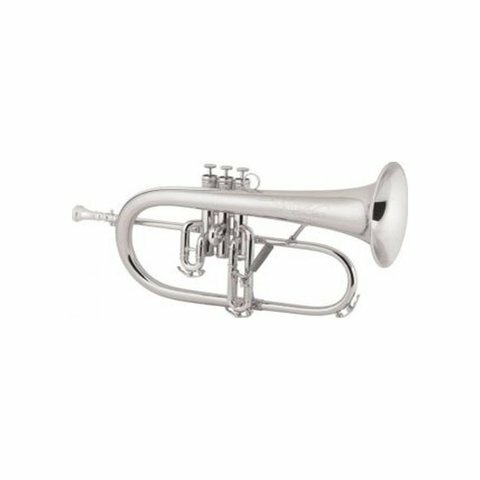 Developed over a period of a year and a half with input from forty professional players around the world, the Vintage One flugelhorn is both elegant in design and warm and rich in sonority. Combining the research of classic design and the precision of modern technology, Vintage One is the ultimate in flugelhorn performance. The Vintage One 1FR flugelhorn was designed to be well balanced and compatible with the player's concept of sound. It combines a responsive .413" bore and a warm resonant one-piece hand-hammered rose brass bell reinforced with a bell bow guard to produce a beautiful, warm, luscious sound. Unlike other flugelhorns, the design of the 1FR holds true intonation when playing above the staff. Professional Monel pistons provide smooth and quick action while the comfortable wood handle 3rd slide trigger allows for quick adjustments. The clear lacquer finish provides a subtle warmth to the overall sound. The Conn 1FR, a flugelhorn with as sound as good as it's looks. Conn "Vintage One" - key of Bb, .413" bore, hand-hammered one-piece rose brass bell, tunable mouthpipe, 3rd slide trigger, Monel pistons, clear lacquer finish, CKB 3FL mouthpiece, 7946C woodshell case. Available in silver-plate finish as model 1FRSP, gold-plate finish as model 1FRGP, and satin silver finish as model 1FRSB.